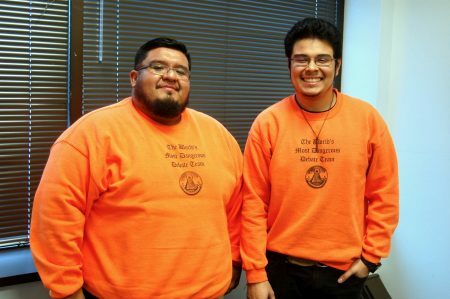 Reagan student Daniel Montalvo chosen from among 11,000 students in U.S.
Daniel Montalvo (right) at the Urban Debate National Championship last year with his partner Harrison Tremarello. Photo courtesy of Daniel Montalvo. Daniel Montalvo initially wanted to pursue archery as an extracurricular activity in high school. However, he found out he wasn’t talented in archery, and then a friend told him about debate. Debate clicked for him on the first day. “It was my thing, right away,” Montalvo said. 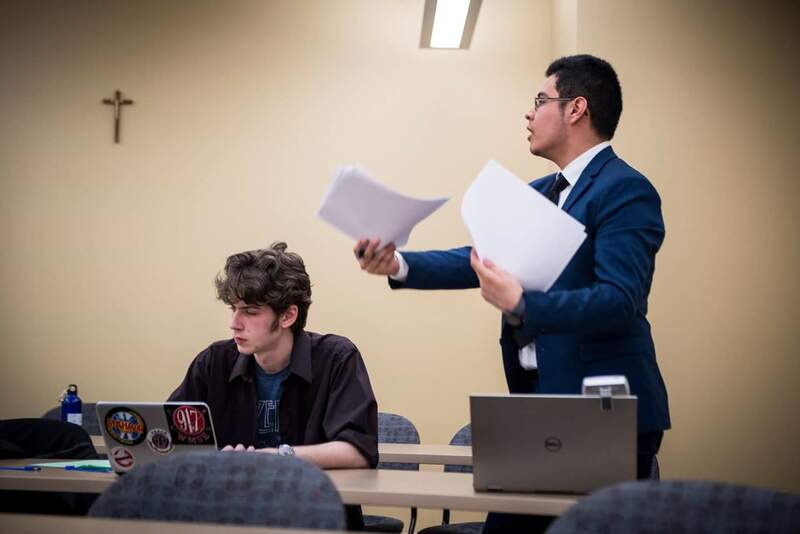 Now in his senior year and fourth year debating, Montalvo was selected as the National Urban Debater of the Year by the National Urban Association for Debate Leagues, out of more than 11,000 student debaters. The national championship tournament will be held in Washington, D.C. from April 19 -22. Montalvo, a student at Ronald Wilson Reagan College Preparatory High School and part of the Milwaukee Debate League, will deliver the keynote address at the dinner before the tournament. Montalvo’s original debate partner declined to attend the tournament because he didn’t want to miss the school’s prom on April 20. Benjamin Michael, a junior at Reagan, will be debating with Montalvo in Washington, D.C.
Daniel Montalvo (right) poses with his debate coach, Oscar Silva. Photo by Rachel Kubik. In his speech, Montalvo plans to thank everyone who has helped get him to where he is now, explain how he got into debate and discuss how it has changed him. John Tao, executive director of the Milwaukee Debate League, said Montalvo is a well-known debater because of his past successes. This year Montalvo and his original partner, Harrison Tremarello, won first place in the city championship. Montalvo also holds the Reagan school record for number of debate and forensics points earned. He has participated in the MLK speech contest for two years and he won third place last year and second place this year. “(Montalvo) is definitely a very critical thinker who loves thinking about the social justice aspect of politics. He really cares about his community and he tries to find ways in which he can interject that into the debates that he has,” Tao said. As a policy debater, Montalvo often talks about his experiences in the Milwaukee Public School system. The topic of the D. C. tournament is government funding and regulation of primary and secondary education in the U.S.
Montalvo said he has not personally experienced gun violence and racial or religious discrimination, but he knows that others deal with those issues every day. Debate has helped open his eyes, he added. Silva said that through the years, the debate team members learned they’re not “supposed to” be debating at certain schools, based on racial stereotypes. He said that when the team shows up, simply because of the color of their skin, other people start watching. Silva added that when the team is winning and qualifying for national tournaments, people should be afraid. “We’re dangerous. Why? Because we know this; this is our life. They’re debating about our life,” Silva said. Silva, 29, explained that he and Montalvo lived less than a mile apart when they were growing up, but they are very different. Montalvo is tech-savvy and logical, and Silva helps him appeal to emotions in debate. “It’s taken four years for us to finally meld our brains together and create this superhuman team,” Silva said. Tao said he has been working with Montalvo to prepare for the tournament, examining graduate-level readings and dissertations. Montalvo said he practices almost every day during debate season, which ended in January. Since then, he has been practicing once or twice a week to prepare for D.C. The Urban Debate National Championship Tournament is highly competitive. Montalvo and Michael are aspiring to make it into the elimination round. “I definitely think they have it in them to reach that, and I think that they’ll be able to at least make Milwaukee known as a force to be reckoned with,” Tao commented. After originally thinking that he wanted to go into computer engineering, Montalvo now plans to be a criminal defense attorney and is considering attending college at Hamline University in St. Paul, Minnesota; University of Massachusetts at Lowell; Marquette University; or Tulane University in New Orleans.